Cheetos plus the KFC signature Crispy Colonel Sandwich = an explosion of flavor! Hurry up and get yours before they sell out. KFC is not afraid to test their customers' senses by pushing products like The Gravy Scented Candle, 11 Herbs and Spices Yule Log, and fried chicken bath bombs. They decided to take it one step further to team up with Cheetos and throw in a Cheetos Fried Chicken Sandwich. There is a catch: The sandwich will only be available in select restaurants in Greensboro, North Carolina; Raleigh, North Carolina; Roanoke, Virginia; Richmond, Virginia; and Greenville, Georgia, so check with your local KFC first to make sure they're one of the locations. According to a report by USA Today, the sandwich will be available through March 24 while supplies last and will be selling for $4.79 a pop. 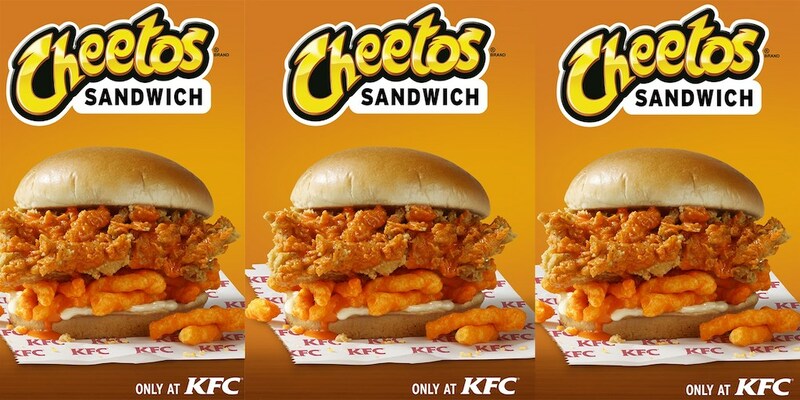 In case you are curious, the sandwich will consist of a hand-breaded extra-crispy chicken filet with a special Cheetos sauce, mayo, and a layer of Cheetos all on a toasted bun. This is not the first time Cheetos has teamed up with other fast food chains -- Remember the Cheetos Chicken Fries from Burger King? Also, they combined forces with Regal Cinemas to create a Cheetos-flavored movie popcorn. I'm curious to see what other creations they come up with! Back in 2017, Cheetos opened a pop-up eatery in New York City called "The Spotted Cheetah," which served 11 Cheetos-infused dishes -- it was a huge success. If that worked, I'm sure that this new creation will, too! Do you think KFC took it too far, or are they on point? You be the judge and let us know in the comments below. Oreo has released a buttered popcorn-flavored cookie. Read more about it here! Head to Virginia's Our Community Now homepage for more local news and features that bring us all together!